With the weather so frigid and the air so crummy lately, I've been really looking forward to Spring and finding myself drawn to both floral and feminine things. 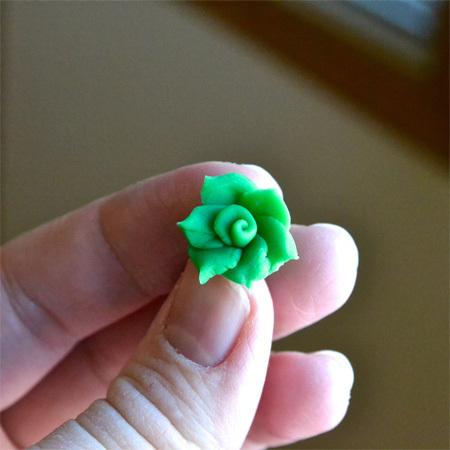 I saw this great tutorial on how to make polymer clay roses and thought I'd give it a shot. 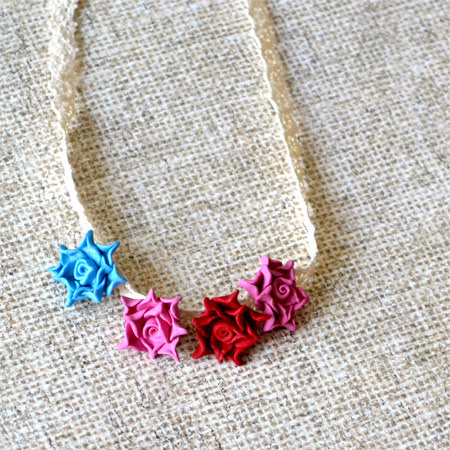 I decided to make mine more stylized and to use them as beads for a necklace. I started out by practicing with Jellybean's play dough. I made several green roses for her. She stuck each one on a toothpick and added it to her creation. I love scented play dough. Mmm, smells like green apple. After I'd practiced for a little while, I decided to break out the clay. Then I carefully poked a hole at the base of each rose using a toothpick. If you need a hole for your project, definitely remember to do it before baking. 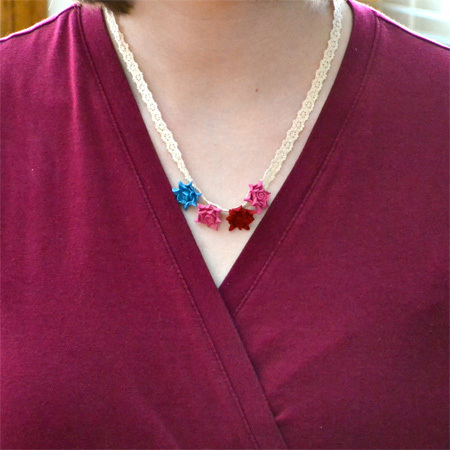 After the roses were baked and cooled, I decided to stitch them to a lace ribbon necklace I found at Hobby Lobby. I love the way it turned out. The necklace might work better as a choker, but I fear that my neck is too short to wear it like that. 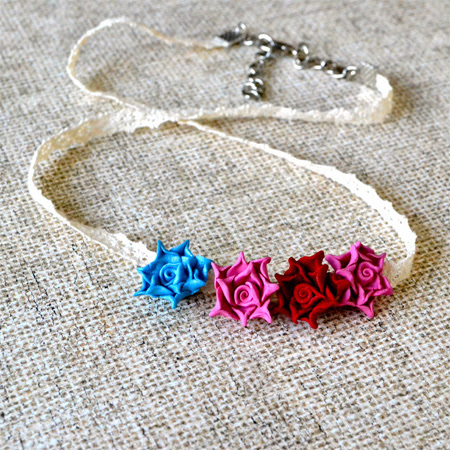 A rose beaded necklace strung on lace. What could be more feminine? I kind of love the blue rose the most. 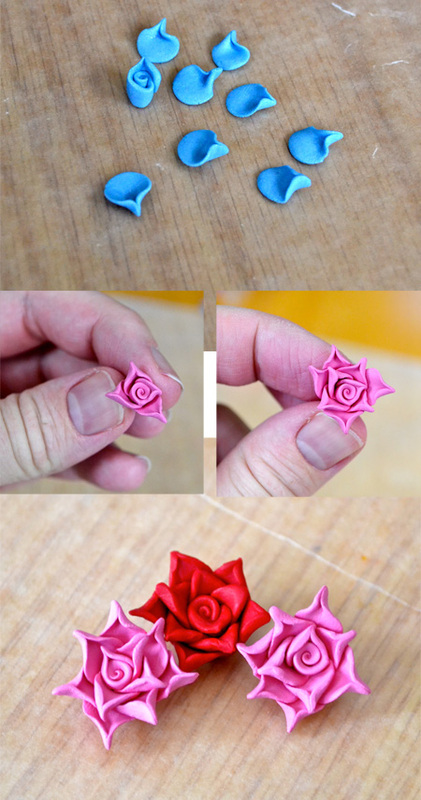 I made several more roses and plan to put together a hair clip for Jellybean. More on that soon. Well, how lovely is that? I'm glad it worked for you! WOW MJ!! The necklace turned out AMAZING!!! The flowers are incredible!! Thanks so much for partying with me last week at The DIY Dreamer... From Dream To Reality! I'm really looking forward to seeing what you share tomorrow evening! Thanks so much for your sweet comment, Christine!